﻿ Neuroset - Consumer Neuroscience and Research. Neuroset offers the most reliable and creative solutions to enhance marketing research with the power of neuroscience. Neuroset is Consumer Neuroscience and Research. We study what consumers watch and feel, how emotions drive their behavior and how they make subconscious decisions. We use cutting-edge brain imaging solutions, biometrics and neuro-psychological tests, to provide your business with unconventional and highly actionable insights. That will put you one step ahead your competition. Why do people purchase from you and not from your competitors? Nearly 85 per cent of consumers choices are driven by intuitive, instinctive and unconscious motivation. At Neuroset we know that traditional market research studies have some limitations. We know that there might always be a gap between conscious opinions and unconscious behavior. Consumers often act differently than they say. 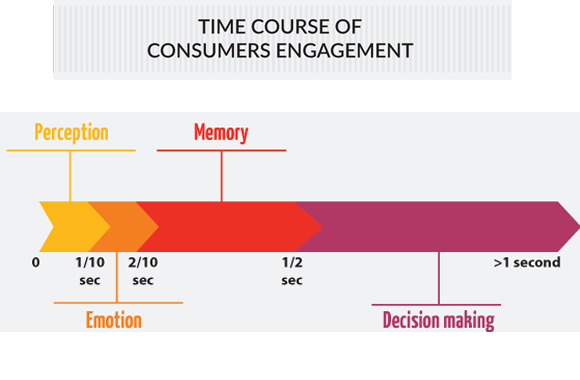 Consumer neuroscience helps understanding hidden elements of consumers decision process. At Neuroset we help brand managers and market professionals uncovering the hidden drivers of consumers behaviour. Our methods are based on trustworthy, scientifically published research, and provide businesses with profitable insights into what drives consumers loyalty, brand perception and purchase behavior. Our tests are almost impossible to falsify, they are easy and quick in capturing consumers subconscious attitudes and feelings. Our tools can help you forecast the market potential of your product, or measure the success of your campaign before its official release. So let’s partner. We’ll take our insights to your business to help you make it stellar. Find out how you can engage your customers’ brain using powerful neuro-hacks. Discover how to grab consumers attention with smart store design, intelligent products positioning, engaging promotional signs, and powerful in-store atmospherics. What makes a product desirable? Whether you’re a big car industry, a TV network, a beauty brand or a social media website, we identify which key features of your product automatically engage your target customers, and with millisecond precision. What makes your customers loyal? How they see your brand, and how this influence their choices? Learn how to measure customers perception and engagement at subconscious level. Find out how your webpage is emotionally experienced by your visitors and optimize your site with amazing neuroscience-based tricks to gain powerful conversions. 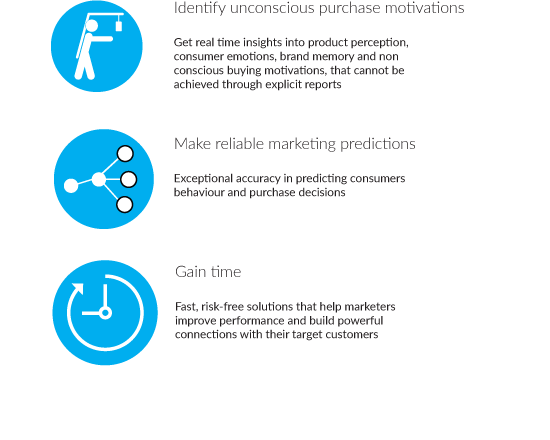 Learn how to apply consumer neuroscience to enhance your business performance. Learn neuromarketing from academic experts and business professionals. Be part of one of our practical courses full of examples, case studies and hands-on materials. With PEMD you can identify, with sub-second precision, the moments when your customers are mostly engaged. This helps you optimize your maketing materials. In about 100 milliseconds, that is faster than an eye blink, your customer's brain will notice and get captivated by your marketing message. Soon after (starting from 2/10 of second), emotions will spark and his whole deep brain will get activated. His memory circuits will compare actual infomation with that stored in memory, and will select what is worth remembering. Finally, he will make explicit decision about your message effectiveness (in about 1 second or more). Let’s make an example: when watching a TV commercial of your product, salient information of your message will engage your customer’s brain in about 1/10 of a second, soon after he will feel joy, sorrow, amusement or love. These unconscious emotions will drive his memories, and in about one second he will start making the decision whether he likes or not what he sees and whether he finds your commercial as motivating or your product worth buying. PEMD measures customers attention and engagement at subconscious level. 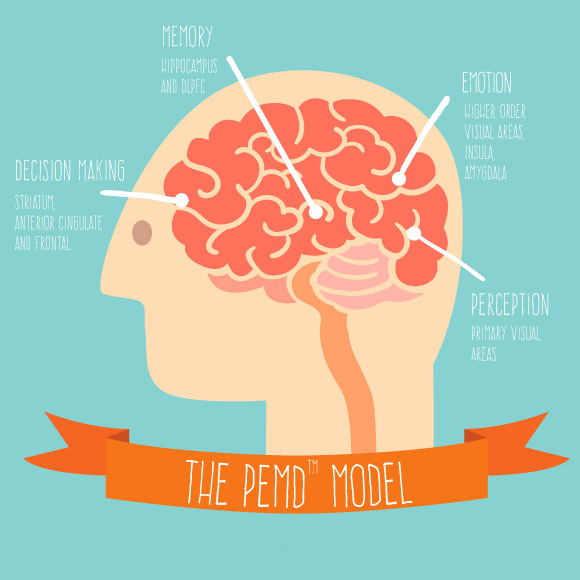 PEMD measures how your products stimulate emotional approach or avoidance. PEMD measures how strongly customers associate unconscious feelings and memories to your brand and whether your message is considered as worth-remembering. PEMD measures how consumers' purchase choices are influenced by two major drivers – reward-seeking and pain-avoidance. Great recipes require great cooking utensils. That’s why we use solid German technology, high sampling frequency rate tools and CE marking certification devices. The same equipments we use in academia. Neuroset will help you find out the right technologies for your marketing needs. Being a team of PhD level researchers, we offer to you the same passion and accuracy we put in our scientific work.